Home Events Is Cincinnati the “Birthplace of the Blues”? It looks like the Wikipedia page for famous blues singer Mamie Smith needs to be updated. New York Times Magazine writer and 2018 Guggenheim Fellow John Jeremiah Sullivan has confirmed that the “Queen of Blues” is Cincinnati’s very own. He will present his scholarship on Smith this week during free lectures at University of Cincinnati’s Clermont campus and the Mercantile Library. His research involved comparing Smith’s birth certificate and data on her parents’ address, plus some general sleuthing about the African-American community in Cincinnati’s west end. Mamie Smith was a jack-of-all-trades in the entertainment industry— she sang, danced, played the piano, and even dabbled in acting. Her biggest hit “Crazy Blues,” recorded in 1920, sold a million copies and cemented her status in early 20th century musical history. In 1994, she was inducted into the Grammy Hall of Fame. 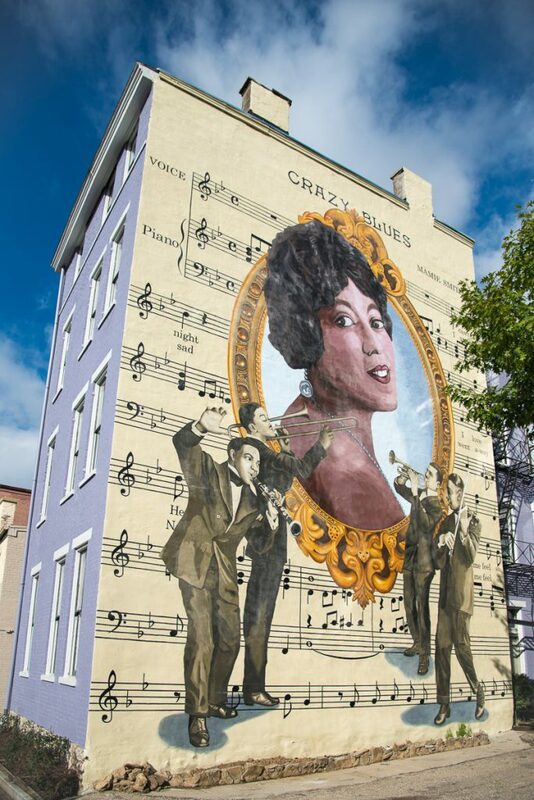 Earlier this summer, ArtWorks completed a mural of Smith in the Pendleton neighborhood (above) as part of its Cincinnati Legends Series, recognizing her status as “a legendary icon in American music history as the first ever African-American blues recording artist.” So, can Cincinnati start claiming blues as our own?